Riverrunner Recreation offers one of the best selections of tackle and lures from Lethbridge to Medicine Hat. 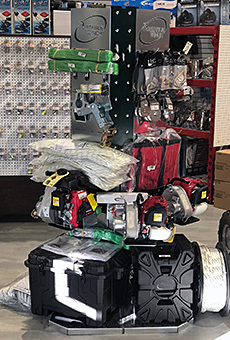 Our wide array of marine and dockside accessories includes Green Mountain Grill BBQ’s, Life-Jackets and Floatation Devices, Skis and Boards, Water Toys, Motors, Pumps, Paddles, Lights, Stereo Equipment and much, much more. 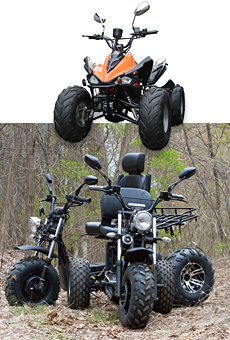 Looking to add some extra mobility? Check out the latest addition to our showroom, DayMak Scooters! Drop by today to check out our full selection! Useful in countless scenarios, the Original Portable Winch has been the world leader in it’s field since first released due to it’s unique design and exclusive features across the entire product line. Powered by Honda or go electric, they are portable, compact, simple to operate and inherently safe to use. Made in Canada! 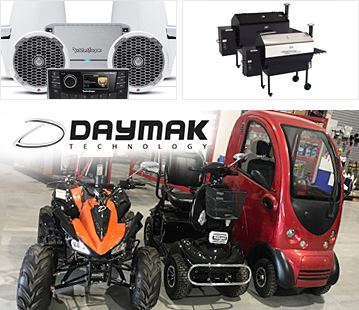 Since 2001, Daymak has been a leading developer and distributor of a great variety of e-bikes, ATVs, scooters, mini-bikes and mobility transport for both on-road and off-road adventure. Barbecue is better dockside! Get the award-winning taste of a Green Mountain Grill on your next outing in a set-up that takes just minutes! Don’t let hard conditions take the pleasure from your cruise. Smooth Moves Seats provides adjustable marine seat mount suspension system with hydralic shock absorbs wave impacts and can even prevent spinal issues. Not only known as the most durable boat seat mount, it’s the most comfortable ride on the market. Incredibly durable lighting systems that stand up to the most extreme conditions Canada wide. Single row, dual row and projector spotlights designed for marine and offroad featuring industry-leading LED specs with military-grade construction, a 5-year manufacturer’s warranty and the highest grade water-proof rating on the market. The best protection for guarding your boating investment! Defend it from road rash and debris damage with Rockgard trailer covers and keep it completely ship-shape it from bow to stern, topside to anchor with our boat protection accessories. Crank up the fun this summer! We sell and install the best marine audio stereo systems available from Rockford Fosgate, JVC and Kenwood with all the upgrades, features and accessories you need to turn your ride up to 10 this year. Get top of the line stereo and head-unit recievers with bluetooth capability and connections for iPod, SiriusXM and smartphones. Riverrunner also installs marine speakers and subwoofer systems, boat-ready amplifiers and amp systems, all designed to withstand the most extremely wet conditions from Southern Alberta to anywhere across Canda and deliver superior sound quality every launch of the way.